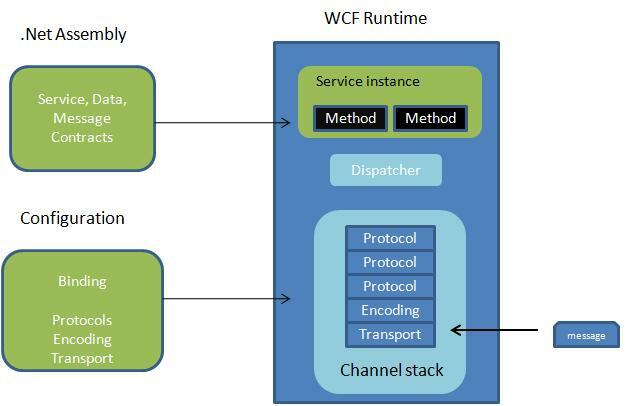 In WCF all the communication details are handled by channel, it is a stack of channel components that all messages pass through during runtime processing. The bottom-most component is the transport channel. This implements the given transport protocol and reads incoming messages off the wire. The transport channel uses a message encoder to read the incoming bytes into a logical Message object for further processing. After that, the message bubbles up through the rest of the channel stack, giving each protocol channel an opportunity to do its processing, until it eventually reaches the top and WCF dispatches the final message to your service implementation. Messages undergo significant transformation along the way. It is very difficult for the developer to work directly with channel stack architecture. Because you have to be very careful while ordering the channel stack components, and whether or not they are compatible with one other. So WCF provides easy way of achieving this using end point. In end point we will specify address, binding and contract. To know more about end point. Windows Communication Foundation follows the instructions outlined by the binding description to create each channel stack. The binding binds your service implementation to the wire through the channel stack in the middle.